Born in Bologna, painter and engraver Domenico Maria Canuti (1626-84) studied first with Guido Reni and later with Guercino and others. Protegé of the influential Abbot Taddeo Pepoli, he moved to Rome and obtained some important commissions there, while picking up the tricks of quadratura ceiling painting. 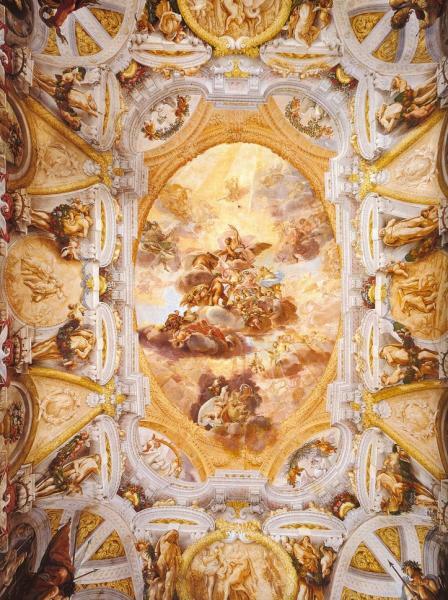 Back in Bologna in 1655, he did frescoes for the Certosa and other churches and palaces, most notably a florid ceiling for his patron's family in the Palazzo Pepoli Campogrande. His last work was the frescoes for the library in San Michele in Bosco.